LankaWeb – It is definitely not a PUNANULA: is only THE NATURAL GRAIN OF THE ROC The object held in the hands is the yoke, the traditional mace of the ancient Sinhalese, As evinced by the Panakaduwa Tamba sannasa. The above statue is popularly recognized and accepted as the figure of King Parakramabahu the Great. But it has also been interpreted as a statue of a sage, either Agastya or Pulasthi by many scholars. Those who call it a stature of a sage give three reasons for their conclusion. First, its proximity to the Pothgul Viharaya that is considered to be the abode od a sage and the other, more importantly is a visible ‘Punanula’ at first sight, that is running diagonally across the left shoulder of the statue from left to right. Thirdly the notion that the object held in the hands is an ola leaf book (puskola pothak). Both H.C.P.Bell and Senarath Paranavitana have interpreted it as a Punanula (a sacred thread). Probably in keeping with their scholastic traditions, they may have wanted to give a more dignified and supra-mundane recognition to the statue and may have described it as that of a sage rather than that of a human. Paranavitana later however has interpreted it as that of Parakramabahu as well. But as an ordinary observer I see the so-called punanula as the natural grain of the rock running from NW to SW of the statue. One can see it clearly and it is more than obvious to the naked eye. A closer examination clearly shows that this so-called Punanula is nothing but the natural grain of the rock that could be seen all over the rock slab where the statue is carved. On the left side this is seen not on the mid shoulder as it should be, if it is a punanula, but far on the edge of the shoulder. There are no signs of rapping it round the body of the Statue, on either side. This ‘wonderful Punanula’ continuous diagonally as one straight line across the whole length of the rock slab from SW to NE as many other similar grains running in the same direction all over the slab. This ‘Punanula’ (sacred thread) is clearly visible running over the object (book) held in the hands of the statue. If it was a sacred thread it should run under the object as a thread worn on the body of the person who is holding the object. It could never be visible running over the book. This argument further confirms that this is not a punanula but only the natural gain of the rock. Therefore I think the idea of a Punanula is either an inadvertent scholarly mistake or an esthetic invention by someone made without a closer examination of the natural gain of the rock, more through scholastic propriety or inclination to profundity. Bu t for the ordinary eye all the visible characteristics clearly proves that, beyond all reasonable doubts, this is actually the natural grain of the rock. Though this line, purported to be the punanula, is more conspicuous than all other lines on the slab, one can see all over the statue running in the same direction, the whole mosaic displays the same pattern. Particularly the line visible about 3 inches below the so-called Punanula is the most prominent. These lines are even more common below that line. Furthermore the same pattern could be seen even in most other statues, both in Anuradhapura and in Polonnaruwa. The most conspicuous of these grains are displayed on the Galviharaya statues in Polonnaruwa. The Standing Buddha being the most prominent among them. Therefore based on these evidence I conclude for certain that this invented punanula is definitely only the natural grain of the rock on which the statue is carved. .Any student of basic geology who is familiar with the general geological formation and the trend line pattern of this part of the Island will vouch for this general pattern in the geological stratification in this part of the Island. The fact that this is found on the tank bund facing the Sea of Parakkrama built by Parakaramabahu the Great 1 (1123-1186) makes it more probable that it is the Statue of Parakkramabahu the Great and no one else’s. The fact that the statue depicts a majestic figure that befits a Royal demeanor also support that this statue represents the colossal figure of a King. As Paranavitana puts it, this statue is an embodiment of strength, majesty and dignity, perhaps qualities that are more akin to Kings rather than ascetics or sages. The object held by the hands is also interpreted by many scholars as an ola leaf book. That may be to prove the original identification of the statue with a sage. There is also another opinion that the object held in the hands of the statue is a yoke that conveys the authority of kingship. It has been said that there is a tradition associated with the yoke (yahala) in ancient Lanka being used as the symbol of Royal authority. The Panakaduwa Tamba sannasa where King Vijayabahu 1 (1055-1110) of Polonnaruwa handing over a nindagam to his Army Commander Budalnavo in appreciation of his role in winning the war against the South Indian enemy. (yahala detin dara …).This brings us to a novel notion of the yoke (Viyagaha) being used as a mace (Senkolaya), the modern symbol of power and authority used in our parliament following the British tradition. Also from this one could surmise that the yoke would have been used in ancient Lanka as a symbol of Royal power, on occasions where Royal power is displayed or symbolized. The yoke an important indigenous tool used in ploughing would have been definitely more appropriate and meaningful for an agrarian society than a modern mace probably adopted from a Yagadawa in the hands of Hanuma, the monkey King in the Ramayana. Whether it is borowed from Ramayanaya or the British tradition it remains alien and inappropriate to our traditions. It also demonstrates colonial hegemony and Indian Hindu mythological influence. The Yahala (yoke) on the other hands befits very well to our milleiu. 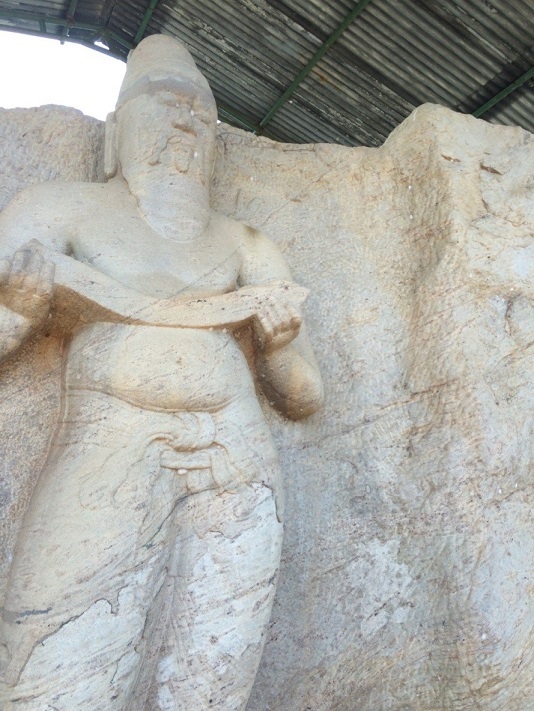 Naturally the King Parakramabahu being the greatest tank builder of the Sinhala nation must, have caused to erect his statue on the bank of the greatest irrigation feat of ancient Sri Lanka overlooking his pet project, the Parakrama Samudraya. It was the greatest achievement of Parakramabahu the Great with the yoke held in the hands to depict the authority of royal power he swayed over his Kingdom, Sri Lanka. Since Vijayabahu lived long before Parakaramabahu one could surmise he knew the Pankaduwava Tamba sannasa tradition set by Vjayabahu. Since Sri Lanka was a farmer Kingdom par excellence the ancient people may have identified the yoke as a sacred symbol that unite the nation and at the same time carrying Royal authority. Therefore it was much more suitable to be used as a symbol of Royal power in this country where paddy cultivation was the mainstay and Buddhism, the State religion on the other hand that shaped the cultural ethos of this great civilization. Isn’t it more appropriate to our context than the modern mace that depicts aggression, awe, fear and terror? Accepting the object held in the hands as a yoke in the hand of the King will also support the notion given in the Panakaduwa copper sannasa. That in turn will throw new light on the notion already in vogue during the time of scribing Panakaduwa Sannasa. If this idea is accepted then we can also send the colonial mace to the museum and replace it with the Parakramabahu yoke as the new Senkolaya, thereby giving a novel and unique concept on the yoke that had been remarkably and strikingly developed in the ancient agrarian Kingdom of Sri Lanka by the Sinhalese, a legacy bestowed to the world on a unique symbol of State power. Isn’t it high time we restore our own pristine traditions without just blindly following the British traditions that have killed our identity? Therefore first I request archeologists to review their interpretation of the punanula adorning the statue of Parakramabahu. Second I would request the erudite scholars and patriotic politicians of this country to review the use of the mace in Parliament and adopt the yoke as the symbol of state power as mentioned in the Panakaduwa Sannasa. This entry was posted on Friday, June 15th, 2018. You can follow any responses to this entry through the RSS 2.0 feed. You can skip to the end and leave a response.